These lesions are notorious for being easier to feel than to see when they are first growing. Usually, they are red in color and slightly rough in texture. As they enlarge, they become much more obvious and can start to resemble warts. 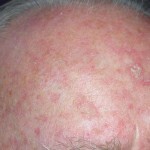 Actinic keratoses come from sun damage. Ultraviolet (UV) radiation causes DNA (genetic) damage in the cells of our skin. As this damage accumulates over time, cancerous mutations begin to develop. 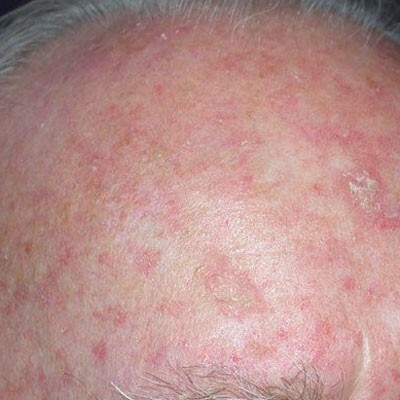 Actinic keratosis show some of the mutations seen in squamous cell carcinoma, but have not yet accumulated enough damage or mutations to become full blown cancers. Unprotected time in the sun. The more ultraviolet light exposure, or the more time you have spent in the sun, the more likely you are to develop actinic keratoses. Outdoor occupation. Even if you do take measures to protect yourself from the sun, people who work outside are still at risk. Living at a high altitude. The intensity of ultraviolet radiation is far higher if you live in the mountains. Light-colored complexion, such as blond or red hair or light-colored eyes such as blue, green, or hazel. When these lesions are found, there are two immediate goals. 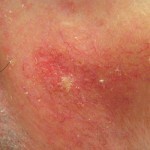 First, they should be removed or destroyed so that they cannot develop into skin cancers. Second, since they develop because of sun damage, screening for other skin cancers is usually warranted. Cryotherapy or cryosurgery is the fastest, most cost effective way to treat small numbers of actinic keratoses. Liquid nitrogen is usually applied as a spray to freeze individual lesions. They become red, tender, and eventually fall away. Aside from the temporary unpleasantness of the treatment and the discomfort afterwards, there are very few side effects. However, freezing sometimes does leave white spots, which can be troubling to some patients. When cryotherapy is no longer practical or proves intolerable, treatment with topical medicines are another option. The newest treatment cream is Ingenol mebutate, which was approved by the FDA in 2012. It comes as a 0.015% gel that is applied to the face and scalp once a day for three days and as a 0.05% gel that is applied to the trunk or extremities once a day for two days. The lesions become red, scaly, and crusty, and then resolve. While it works fast, it only gets rid of all the actinic keratoses 30-50% of the time. The most effective topical agent is 5-Fluorouracil (5-FU). It is sold under a variety of names, including Carac and Efudex which differ in their potency. When the 5% strength is used, the cure rate is usually above 90%. The treatment can lead to significant discomfort and redness, however, the outcomes are usually quite impressive. Imiquimod is another topical choice. Imiquimod works by stimulating the immune system to attack precancerous cells. It too comes in different versions (Aldara 5% and Zyclara 3.75%) which differ in their cost, dosing regimen, and side effect rates. Diclofenac is a non-steroidal anti-inflammatory drug that has weak activity toward actinic keratoses. Treatment requires applying a gel twice daily for 3 months. The response rate is poor, but it is usually very well tolerated.